I’m joined by author Rebecca Bradley today. Her latest novel is Dead Blind and is available now. More about that later. She has written a guest post which has links to one of the subjects of her book. You might not want to read it if you are eating your breakfast though! 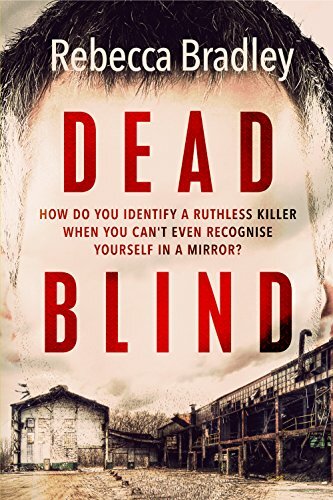 My new novel, Dead Blind, deals with, as well as the main subject of prosopagnosia (face blindness) it also covers the rather difficult subject of organ donation and how few organs there are available for the patients waiting. Because of this situation a black market in the organ trade has sprung up to attempt to fill this void. And desperate people are willing to go to extremes in order to live and other desperate people are willing to donate parts of their own body for a little bit of cash. So, as this is a blog post and not a dark crime read, let us look at some of the more interesting things you can do with your body, rather than illegally donate parts of it to a black market organ ring – but the caveat is that you have to be dead. There’s no doing any of this while you are alive. Though most of the donation of organs has to happen in death, the kidney for example can come from a live donor. Some of these will depend on whereabouts in the world you live so if you are interested you will have to Google it to see if your country of origin offers it. But, I assure you, these are all real options. Donate your body to a medical school. You will become an important resource for training the medical professionals of the future, or for research purposes. There are strict guidelines around disposal once your body has finished its purpose. In the UK these guidelines can be found on the website of the Human Tissue Authority. Donate your body to a body farm. So far this is something that can be done in countries such as the US and Australia but the UK are behind the times as far as forensics are concerned in this area, but last year one university started to lobby to create a body farm here in the UK stating that we face different problems because our ground is not the same as US or Australia. That certain real murders would have been helped if we had had forensic evidence from body farms on body decomposition. So, watch this space to see if the UK will have its very own body farm in the future! These are most definitely now a thing. The burial and cremation process is highly ecologically unfriendly. So, if you love the planet you can choose to have a very green burial. You can do this partially by going with a green casket in woven willow, or go even greener which isn’t a casket but is just a wrap, blanket or shroud. If you want to go the full green eco-friendly burial trip there are now natural burial sites in most countries reserved for this. Some ground is dug, you are placed in, no box, I’m not sure about the shroud, but then you are covered in dirt. There is no plaque, no headstone, you are left to rot and go back to the earth as natural as it is possible to be. There are small pathways through these fields for families to visit, but no markers. The key word in all of this is natural. This one speaks for itself. You may not be aware, but you can do this in the UK and you don’t need to have a connection to maritime life. Though there are only three specific places it can be conducted and a special coffin is required. It is recommended that you scatter your ashes at sea though rather than be buried, it lessens the chance of your body being washed up. If you believe there is a chance you will come back from the dead with the advancement of medical science you can always choose to be frozen. In Tibet, you are placed on the top of a large hill and left for the birds to pick over you. Now your ashes can be made into a host of objects. One is a diamond. Maybe your loved ones want to wear you close or have you displayed over the fireplace. You never have to leave your loved one. Ever. So, anyone changed their minds on what they want to do when they die now they’ve read this? It’s certainly given me food for thought Rebecca – who knew there was so much you could do after you’ve gone?! How do you identify a ruthless killer when you can’t even recognise your own face in a mirror? Returning to work following an accident, Detective Inspector Ray Patrick refuses to disclose he now lives with face blindness – an inability to recognise faces.As Ray deceives his team he is pulled into a police operation that targets an international trade in human organs. And when he attempts to bring the organisation down, Ray is witness to a savage murder. But it’s a killer he will never remember.The pressure mounts as Ray attempts to keep his secret and solve the case alone. With only his ex-wife as a confidant, he feels progressively isolated.Can he escape with his career and his life intact? Order your copy online here: mybook.to/DeadBlind – this is a geo link and will take you to the Amazon site of the country you live in. Catch up with Rebecca on social media and her website.